Hi, my name is Missouri Vaun. As the title of this post suggests, I am a newbie lesbian romance writer. I am currently finishing up my first novel for publication. I’m working with an editor on finalizing the manuscript now. I can’t wait to tell you about it when it’s done. I must admit that I’m drawn to Southern writers, maybe because my roots are in the Deep South — rural, southern Mississippi, where community and storytelling are strong parts of everyday life. I think as a kid, I was always imagining characters and stories as a way to stave off boredom, during long hot summers. When I am not working on my novel, I am drafting notes of people I’ve met and those I wish I had. Characters I want to explore. During my 12-year tenure as a journalist I met a lot of interesting people. My career took me to places as far in miles as regional dialects as Chicago and Jackson, Mississippi. But I quickly learned that despite it all, we’re not all that different. Most of us value loyalty and responsibility to others, and my stories do the same. Do you ever wonder what events in your life have altered your fate? Or what lies ahead as a result of actions you took long ago? My stories delve into this, too. My wife and I will be celebrating six years together this summer. Time flies. 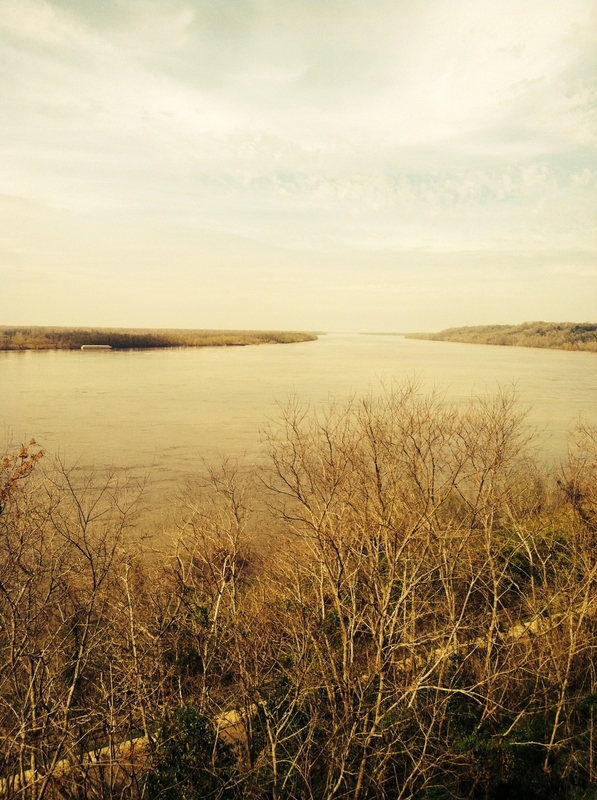 I remember when we took this picture of the mighty Mississippi River near Natchez. The Mississippi River is one of my favorite waterways. Once, when I was driving through Memphis heading west, I crossed and re-crossed the bridge several times just to enjoy the river view. Lastly, I love staying in touch. You can follow me here at my blog. You can enter your email address in the form on the Contact page of my site so you can receive emails from me. I have a Facebook page, and I tweet on Twitter from @MissouriVaun. I look forward to hearing from you. Boom. This answers question two of the next blog. “Most of us value loyalty and responsibility to others, and my stories do the same.